The Honeywell HFD 120 Q Tower Air Purifier is a standing, house air cleaner, and purifier. This advanced quiet purifier uses a permanent High-Efficiency Particulate Air (HEPA) filter which is washable. The Honeywell HFD Tower 120 is 99.9% efficient in eliminating airborne particles and potentially harmful airborne substances. Including dust-mite allergens, pollen, and smoke. It works to deodorize smells associated with cooking, mold and mildew, smoke and other odors by removing odor-causing particles from the air via a triple system of pre-filter absorption, IFD filtration, and ionization. The Honeywell HFD-120-Q is a moderately priced air purifier that delivers above-average results. While the inability to control the ionization and oscillation will frustrate some users, most will find that their needs are met by this model. The 3 level air filtration system provides a strong and quick solution to odors common to households. The system works quickly to filter and circulate air. This air cleaner’s 3-stage filtration system is equipped with permanent dual IFD filters. Best of all, these filters never need changing, which saves you money on expensive filter replacements. Simply wash or vacuum them periodically. Don’t worry if you forget. This air purifier also includes a washable pre-filter to eliminate large airborne particles as well as an ionizer for a final layer of cleaning and freshening. In addition, you can use the convenient oscillation mode to ensure that fresh air is dispersed evenly throughout your room. This machine is silent. It circulates just as much air as my 21-inch box fan, It has a weighted base which keeps it stable as it oscillates, it has washable filters that must be allowed to dry before you re-install them. The oscillating feature does not have a dedicated on/off switch, so the purifier will oscillate for as long as it is on. Honeywell Air Purifier HFD-120-Q has a built-in filter check indicator light that remains red when the filters need to be cleaned. This air cleaner will do a great job in eliminating pet dander and mold spores. Honeywell HFD 120 Q Tower unit promises to eliminate up to 10 times more airborne pollutants than many competing air purifiers and even larger amount when compared to ionizer filters. The HEPA air cleaner uses a permanent Honeywell air filter that can be easily washed rather than replaced. Non-replaceable filters mean that your initial investment is your last one. You will be able to keep the Honeywell HFD-120 air purifier running for its entire lifetime by manually cleaning the filters regularly. It is recommended that you clean the filters on a regular schedule. The more often, the better in order to extend their lifespan. Allowing dust and particulates to collect on the filters will significantly diminish the device’s effectiveness. The Honeywell HFD-120-Q QuietClean tower air purifier is lightweight, energy star verified and more efficient than other products which process air through an ionizer device. It only uses as much power as a typical household light bulb. Unlike many air purifiers, the Honeywell Tower is up to 30% quieter. The large fan used in the HFD-120-Q QuietClean Tower Air Purifier is capable of recycling and cleaning an area up to 170 square feet and up to five times every hour. The sleek design makes this unit a good option for larger bedrooms as well as small spaces, living rooms and kitchens. The construction of the unit is sturdy and durable. The number of times air changes per hour will take place is as follows: 10 times for small rooms up to 80 square feet, five times for medium rooms up to 170 square feet and 2.75 times for large rooms. The Honeywell HFD 120 Q features LED control that sounds an alarm when its time to wash the filter. 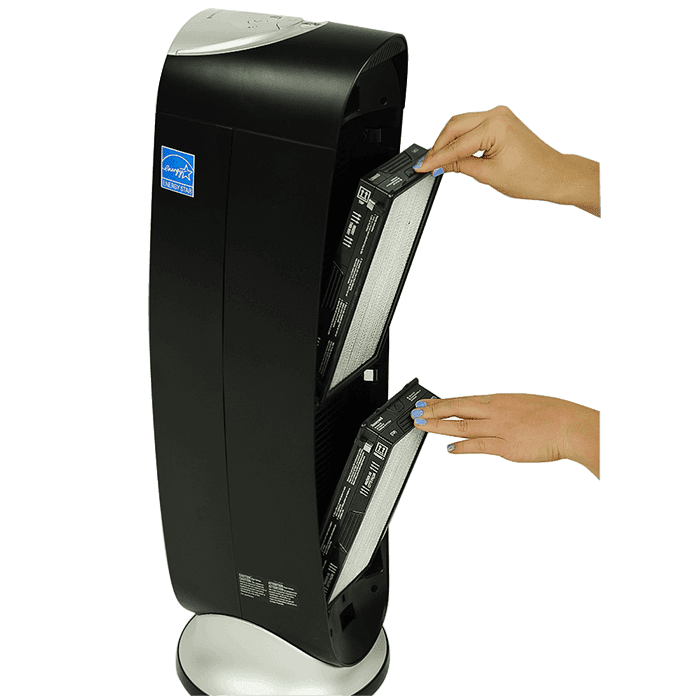 The user can choose from three air purifier cleaning speeds. The unit features an oscillation option which allows the machine to circulate purified air around the room. On the low setting, it will be barely heard, and on medium and high it will be no louder than a fan. Honeywell HFD-120-Q Tower Quiet Air Purifier is a good choice for those who have asthma and other respiratory allergies. The Center For Disease Control recently recommended that HEPA filters be used in all medical facilities to reduce the incidence of flu outbreaks and infections in those facilities. This model comes with a built-in ionizer. It releases negative ions into the room. The negative ions bind to oxygen molecules and create clumps of particulate matter which can then be filtered through the machine. The unit must be placed at least three feet from a wall or furniture. As the HFD-120-Q Tower Quiet Air Purifier cleans the air, it might create dust and debris around the unit which should be vacuumed regularly. The unit should not be placed horizontally. It should not be used it damp or wet spaces, or in any area that might contain gas or other vapors. One problem is that the ionizer cannot be turned on or off independently of the purifier. People who are bothered by ionizers will not be able to use this product. The ionization process may create low levels of ozone which may irritate people with pre-existing lung conditions, those with asthma and allergy suffers. Though Ionization is negligible, contradictory statements come into question. Honeywell HFD 120 Q tower air purifier is recommended for asthma and allergy sufferers but Ionizer which this air purifier use is not. The unit must be placed at least three feet from a wall or furniture. While HFD 120 Q Tower Quiet Air Purifier cleans the air, it might create dust and debris around the unit which should be vacuumed regularly. The unit should not be placed horizontally. It should not be used it damp or wet spaces, or in any area that might contain gas or other vapors. Some users find the smell of the machine itself out of the box to be unsettling, but most conclude that it dissipates after a few days of use. Using QuietClean technology, an internal three-speed fan circulates and filters fresh air throughout your room with whisper-quiet operation. Moreover, straightforward touch-button controls make operating the unit a breeze. This model produces a typical amount of white noise for its price range. It should not interfere with TV on the medium setting, and it is possible to sleep through if you are comfortable with the sound. Light sleepers will want to use the lower setting. The Honeywell model # HFD-120 Q has CADR ratings of 100 / 110 / 132. This is decent for most homes and is sufficient for most basic uses. Energy Star Rated – It uses less energy compared to other brands. It saves you a lot on your utility bills. Can you turn off the ionizer? No, it is always on. How well does this work for getting rid of cigar smoke? It handles the cigarette odor quite well. No, it doesnt have a remore controler. Just wash under the water, rinse it. wait for dry, and put it back to the machine. It is very quiet compared to most air purifiers. Does this unit emit ozone? has an electrostatic element in addition to a filter so it has that potential. The Honeywell Oscillating Tower Air Purifier HFD 120 Q is a moderately priced air purifier that delivers above-average results. While the inability to control the ionization and oscillation will frustrate some users, most will find that their needs are met by this model. It is worth repeating that maintaining and cleaning filters is essential for lifespan and efficacy. Honeywell HFD 120Q QuietClean Purifier is intended for medium-sized rooms. It comes with QuietClean HEPA filter. Note that it is not True HEPA filter. The difference between True and HEPA filter is that True can capture particles as small as 0.3 microns while HEPA captures particles as small as 2 microns. Love it! It’s really helped with my dust and dog hair allergies! I’ve had it for months now and no issues. Honeywell 120 purifier comes with three stage filtration system. The pre-filter is the first line of defense and will catch large particles such as particles of dust and pet hair. The high-performance filter is in charge to capture particles as small as 2 microns like pet dander, dust particles, and pollen. Lastly, an ionizer which will fill the air with ions to get fresher air. But ionizer can’t be turned off. Not sure if Honeywell HFD 120 catches odors like smoke from cigarets. The manufacturer says it does and even some buyers comment that it purified air from smoke too. But can’t be sure as smoke particles are about 1 microns and Honeywell HFD can only clean particles as small as 2 microns. Cleaning odors from cooking should work well. One of the best things is that Honeywell HFD-120-Q uses a permanent washable filter. You will save money as you will not have to buy a new filter every year. You only need to wash filter every few months. Leave it to dry before putting back. You should buy HFD 120Q Honeywell Tower Air Cleaner as it is one of the cheapest air purifiers with a permanent HEPA filter. Honeywell HFD-120-Q is a Tower Air Purifier intended for medium-sized rooms. It comes with QuietClean HEPA filter. I got to warn it is not True HEPA filter. Difference between True and HEPA filter is that True can capture particles as small as 0.3 microns while HEPA captures particles as small as 2 microns.